Ella Dewees Cochran (1892-1991) began making portrait dolls of real children ca. 1934, which were popular with wealthy clients, shortly afterward Dewees moved to New York to create a more affordable, but quality doll. She then created six basic dolls in 1936, each with a different face shape and by changing the hair or eyes, could produce a portrait doll of most children. These were her Look- A-like dolls. 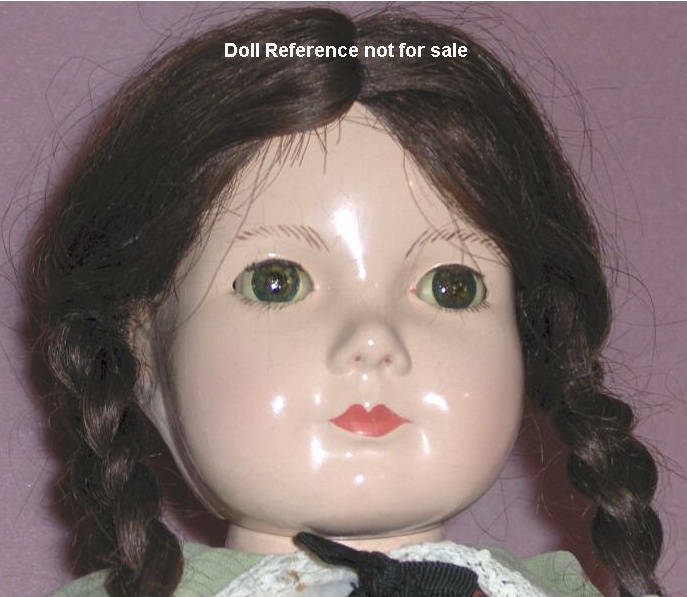 Dewees also designed dolls for the Effanbee Doll Company in 1936, which are called American Children dolls. 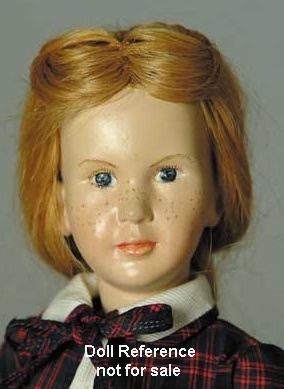 During World War II doll production ceased, but after the war she formed the Dewees Cochran Doll, Inc. company. 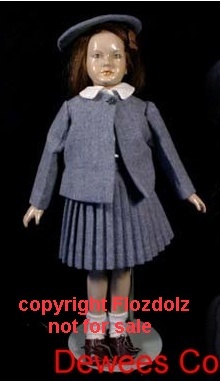 She contracted with the Molded Latex Company and produced the Cindy doll in 1947-1948. The final series of dolls were the Grow-Up dolls and small Baby dolls sized 5-9" tall in the 1950s. 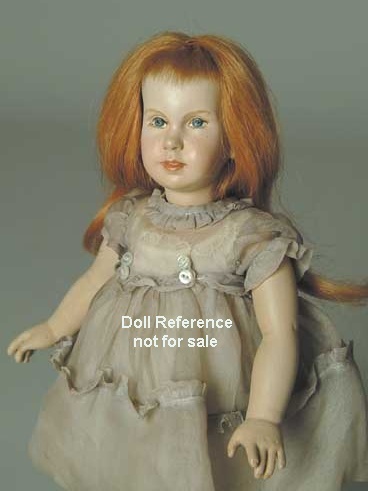 Ms. Dewees retired in the 1960s and the company ceased doll production by the 1970s. 1934+ Portrait Dolls, various sizes, carved wood heads, human hair wig, painted eyes, open or closed mouth, stuffed jointed silk body. Marked: Dewees Cochran under the arm or behind the ear. 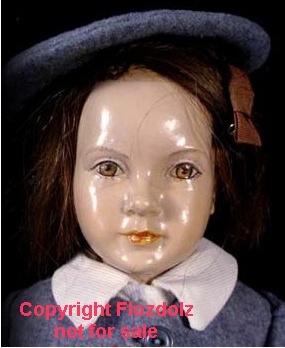 1936+ Abigail, 17" tall, all latex, square face, jointed body, human hair wig, painted eyes with real lashes or painted, closed slight smiling mouth. 1936+ Cynthia, 17" tall, all latex, oval face, jointed body, human hair wig, painted eyes with real lashes or painted, open smiling mouth with teeth. 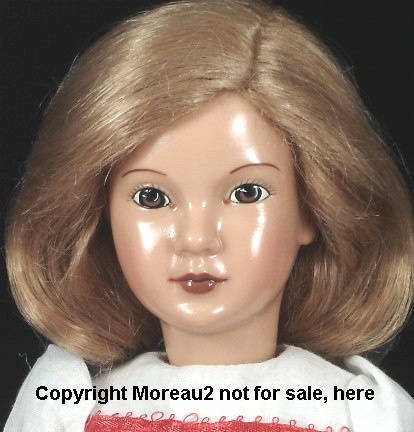 1936+ Deborah, 17" tall, all latex, heart shaped face, jointed body, human hair wig, painted eyes with real lashes or painted, closed slight smiling mouth. 1936+ Jezebel, 17" tall, all latex, round face, jointed body, human hair wig, painted eyes with real lashes or painted, closed slight pouting mouth. 1936+ Lisa, 17" tall, all latex, triangular face, jointed body, human hair wig, painted eyes with real lashes or painted, closed slight smiling mouth. 1936+ Melanie, 17" tall, all latex, long thin shaped face, jointed body, human hair wig, painted eyes with real lashes or painted, closed slight smiling mouth. 1936-1939 American Children Portrait dolls, six dolls were contracted by Effanbee to be produced for the 1936 Toy Show that were designed by Dewees Cochran, they are 17 or 20" tall, all composition socket head with jointed body, human hair wig, tin painted eyes or sleep eyes, closed or open mouth. Usually marked: Effanbee American Children or Effanbee Anne Shirley (when they used the Anne Shirley body) or unmarked. See our related Effanbee Little lady doll - Anne Shirley doll clothes page. 1936-1939 Effanbee Gloria Ann doll, with dark brown hair, 17 or 20" tall, closed mouth, all composition socket head with jointed body, human hair wig, sleep eyes, closed mouth. Marked: Effanbee American Children or Effanbee Anne Shirley or unmarked. *reproduced by Effanbee & dressed by Robert Tonner in 2003 & 2004. 1936-1939 Gloria Ann doll, 17"
1936-1939 Effanbee Ruth Ann doll, with auburn hair, 17 or 20" tall, closed mouth, all composition socket head with jointed body, human hair wig, sleep eyes, closed mouth. Marked: Effanbee American Children or Effanbee Anne Shirley or unmarked. * *reproduced by Effanbee & dressed by Robert Tonner in 2004. 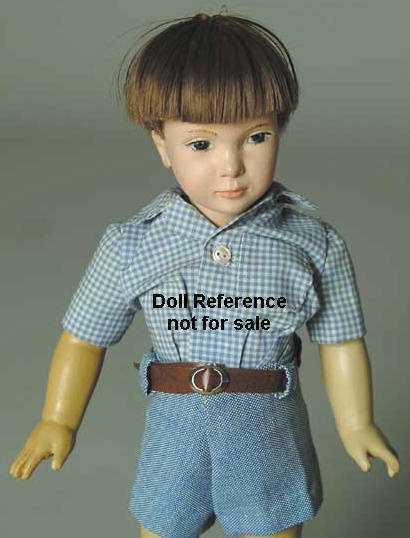 2004 Ruth Ann doll, 21"
1939 Effanbee Boy doll (name unknown), 17" tall, was sold only one year, all composition socket head with jointed body, painted eyes and closed mouth, blonde human hair wig, he is unmarked. 1936-1939 Effanbee American Portrait Dolls; Barbara Joan doll, 15" tall, also used to make the 1939 Ice Queen doll, Barbara Ann doll 17" tall, Barbara Lou doll 21" tall, all composition socket heads with jointed body, human hair wig, tin painted or sleep eyes, open mouth, dolls marked: Effanbee American Children or Effanbee Anne Shirley or unmarked. Also, Betty Jane doll and Peggy Lou doll, size and details unknown at this time. 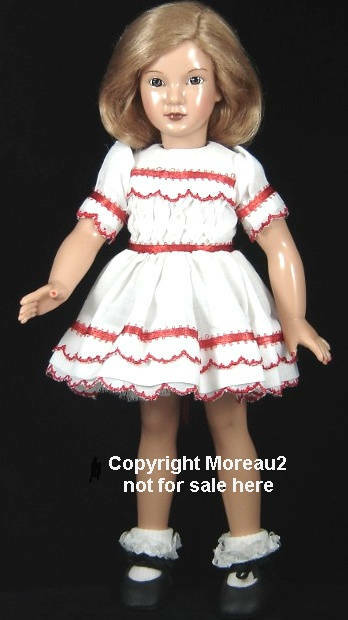 out of production, however the Molded Latex Company continued to produce the few dolls unmarked anyway. 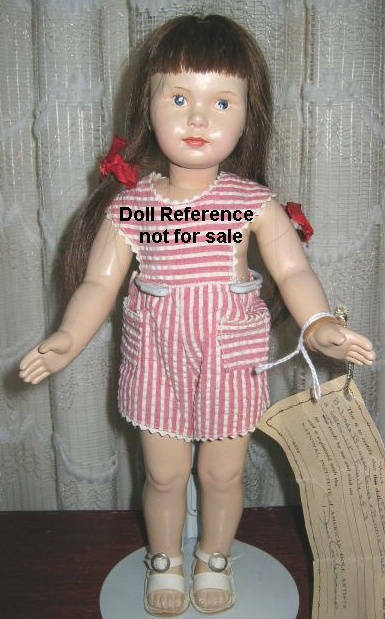 1947-1948 Cindy doll, 15" tall, all latex jointed body, human hair wig, painted eyes, real lashes or painted, closed slightly smiling mouth, marked: a production number, Dewees Cochran in an oval. 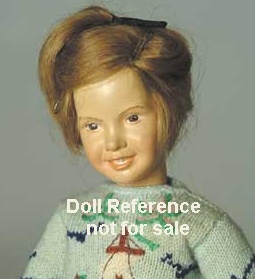 Reproduction doll is 14" tall. This series of doll progressed in age (and height) from 5, 7, 11, 16 and 20 years of age, over a five year period, so a child could "grow-up" with their doll. 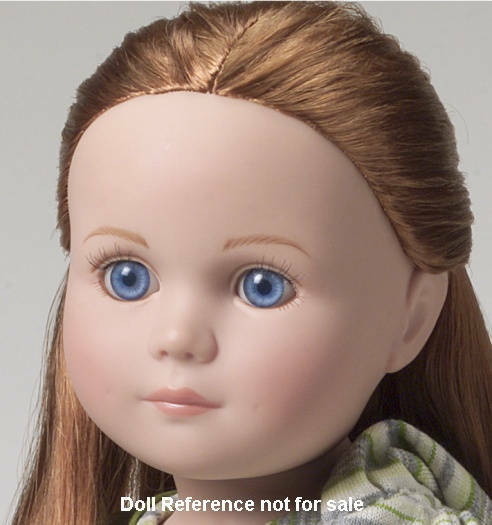 Dolls are signed with DC + the dolls initials and production number. 1952-1960 Angela (Angel) Appleseed doll, 12 1/2, 15 1/2 or 18" tall, blonde hair, all latex jointed body, human hair wig, painted eyes with real lashes or painted lashes, marked: DC AA #/#. Angela doll shown is 15 1/2" tall and about 11 years of age. 1952-1960 Angela (Angel) Appleseed doll, 15 1/2"
1952-1960 Belinda (Bunnie) Bunyan, 12 1/2, 15 1/2 or 18" tall, brunette hair, all latex jointed body, human hair wig, painted eyes with real lashes or painted lashes, marked: DC BB-54 #. Belinda doll shown is about 7 years of age and is 12 1/2" tall. 1952-1960 Belinda (Bunnie) Bunyan doll, 12 1/2"
1952-1960 Susan (Stormie) Stormalong doll, 12 1/2, 15 1/2 or 18" tall, auburn hair, all latex jointed body, human hair wig, painted eyes with real lashes or painted lashes, marked: DC SS-58 #. Susan doll on left is about 7 years, 12 1/2" tall and on right she is about 11 years and 15 1/2" tall. 1952-1960 Susan (Stormie) Stormalong doll, 15 1/2"
1957-1960 Jeffery (Jeff) Jones doll, 12 1/2, 15 1/2 or 18" tall, brunette hair, all latex jointed body, human hair wig, painted eyes with real lashes or painted lashes, marked: DC JJ-60 #. Jeffery doll shown is about 7 years of age, 12 1/2" tall. 1957-1960 Jeffery (Jeff) Jones doll, 12 1/2"
1957-1960 Peter (Pete) Ponsett doll, 12 1/2, 15 1/2 or 18" tall, blonde hair, all latex jointed body, human hair wig, painted eyes with real lashes or painted lashes, marked: DC PP-55 #. Peter doll shown is about 7 years of age, 12 1/2" tall. 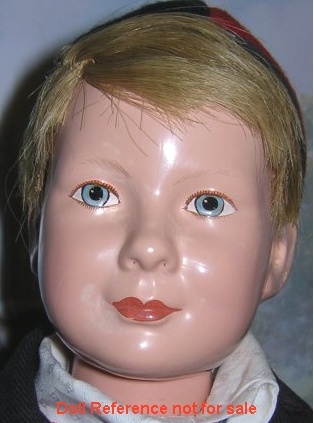 1957-1960 Peter Ponsett doll 12 1/2"